Have you ever thought of hiring a hydraulic cable drum trailer for your onsite as well as offsite jobs? A cable drum trailer helps in carrying heavy cable drums from one part to another in a smooth manner without causing any kind of accidents. Read on to know more. Hydraulic cable drum TRAILERS are used for transporting of materials and heavy goods from one project site to another in a smooth and seamless manner. The drums are made with the best kind of premium quality materials with updated techniques as per the standards of the industries. There are a variety of sizes of hydraulic cable drum trailers with different technical specifications that can be customized as per the requirements of the customer. Hydraulic cable drum trailers have been designed in a way so that they can carry optimum strength. It is very easy to install and has a long and durable life that can carry loads for a long time. It has been highly in demand because of its excellent performance as well as convenience and reliability. It has leaked pins that help in controlling the lifts in case of failure. It also has a locking system that helps to hold the cable drums in place while in the action. Our cable drum trailer has been designed in a way so that it can carry heavy load from one place to another in a seamless manner. It has wheels that can be used for moving as well as unreeling cable drums. They are safe and secured and also avert accidents. These trailers can be towed by vehicles like tempos, jeeps and trucks depending on the load of the drum. 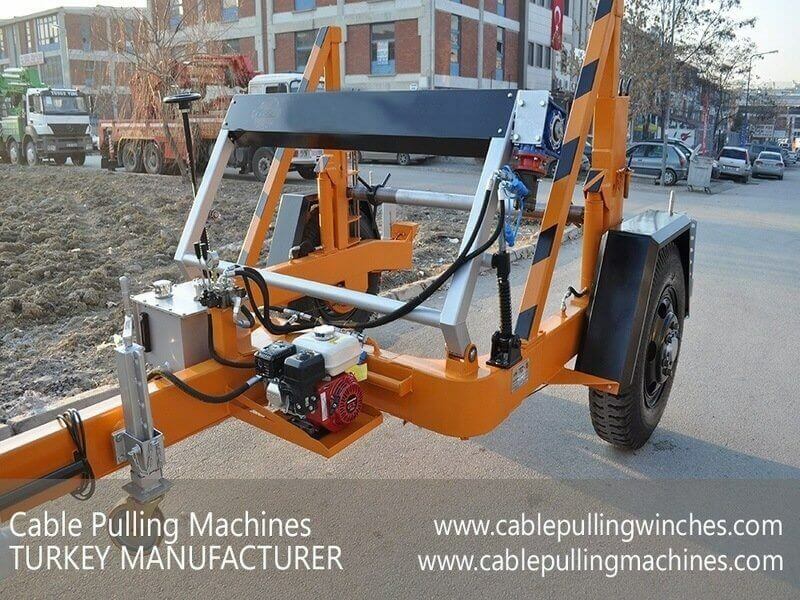 This is very handy equipment that comprises of heavy tires.Our Hydraulic cable drum trailers at cable Pulling machines are affordable, reliable, and convenient and made with the best quality materials so that they can be used for a long time as well.